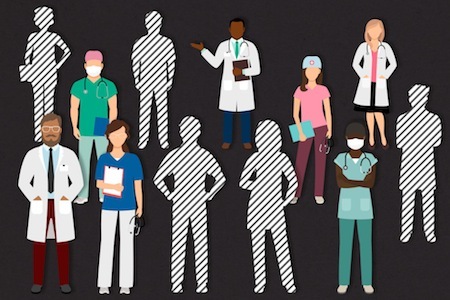 Health and education leaders across California have joined forces with business and labor leaders to address workforce shortages in health care. The new group aims to create a blueprint for policymakers. Ensuring adequate health care staffing is increasingly important because more Californians are insured and schools cannot produce physicians, nurses and other providers fast enough to serve them, said Jeff Oxendine, a dean at the University of California-Berkeley’s School of Public Health and co-director of the commission. A lack of qualified professionals can also drive health care costs higher by heightening the demand for their services. The commission plans to focus on three areas: primary care, mental health and the aging population. California’s health care staffing shortages are well documented and projected to widen as the population grows and physicians retire. The state will lack about 4,700 primary care doctors by 2025, according to a recent report by the Healthforce Center at University of California-San Francisco. The Central Valley, Central Coast and southern border areas will be hardest hit, according to the report. To ease the shortage of primary care physicians, for example, medical schools could accelerate training so students could graduate faster. To help seniors age in their communities rather than in nursing homes, the state could ensure that home care workers earn more than the current average of about $11 an hour. Barnett also cited a growing need for more people to work outside the clinical setting, helping patients with housing, food, transportation and other services that can affect their health. Many areas, particularly in rural parts of the state, also do not have enough psychiatrists and other behavioral health providers to serve their communities. That creates a burden for patients who may have to travel long distances for mental health care or substance abuse treatment. “We still have a ways to go to ensure timely access to quality [behavioral health] services, particularly for our Medicaid populations,” Barnett said. In addition, the commission plans to address the lack of diversity among health workers. Latinos make up nearly 40 percent of the population but only 7 percent of doctors and 8 percent of nurses are Latino, according to the Medical Board of California. Informing young people from underserved areas about health careers and providing opportunities to pursue them could help with recruitment and retention of a more diverse workforce, Oxendine said. Health employers consider workforce sufficiency to be a “business imperative,” Oxendine said. Increased competition for a shrinking pool of medical professionals drives up costs, he said. One of the commissioners, physician Hector Flores, said one of his priorities is to examine whether health care workers can provide services that are better, faster and cheaper. One way to do that could be to have more community health workers and medical assistants working alongside doctors and nurse practitioners, he said. “Team-based care is not only better and friendlier for patients, but it also reduces costs overall,” said Flores, chairman of the family practice department at White Memorial Medical Center in Los Angeles. University of California president Janet Napolitano and Dignity Health president Lloyd Dean will co-chair the commission, which is scheduled to hold its first meeting next month and plans to issue research and recommendations throughout the year for state legislators, schools, health care employers and others.